we have to note that the gold weems law firm controls the federal throne here in alexandria maybe that has something to do with the louisiana attorney disciplinary boards inaction? ya think? You may have been the victim of legal abuse by your own lawyer. 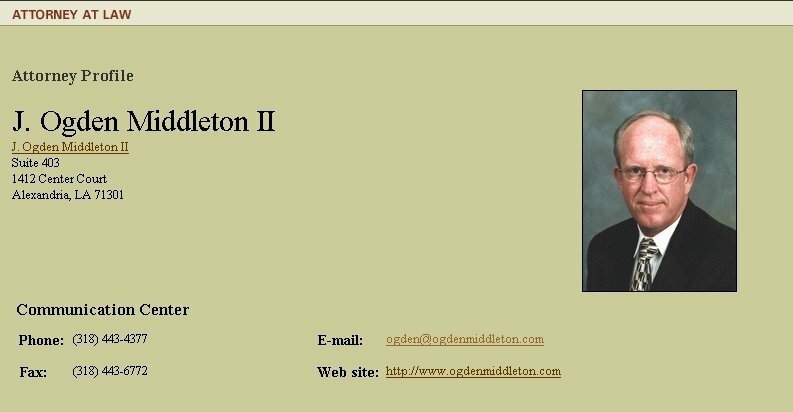 The Ogden Middleton Victims (OMV) Group is currently composed of twenty (20) residents of Central Louisiana who have made, or are making, formal claims against Mr. Middleton to the Louisiana Attorney Disciplinary Board (LADB) based on common allegations and experiences of overbilling, churning, and misrepresentation by Mr. Middleton and the Gold Weems Law Firm over a span of ten years. At least four other fomer Middleton clients have elected not to file claims due to fears of intimidation and litigation with their own lawyer. If you have a similar experience contact us to assist you in making your claim. The inaction of the Louisiana Attorney Disciplinary Board against J. Ogden Middleton II and the Gold Law Firm comes amid growing criticism among small firms that the board does not regulate major law firms in the same manner as it does smaller firms. 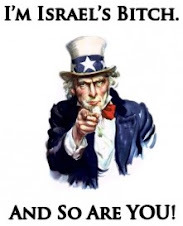 While it is true that small or individual law firms populate most of Louisiana, and that they tend to have the largest number of consumer complaints, it is also true that there is no published evidence the board regulates larger firms with the same efficiency. In fact, the LADB's stated policy in response to a complaint from Dr T.Mac Granger against the Gold Law Firm confirms that it does not regulate law firms, only lawyers. We have to ask, then, who regulates those attorneys the state licenses? Twenty former clients of the Gold Law firm have made or are pursuing formal complaints to the LADB about Middleton who was in charge of the Family Practice division of the Gold Firm, and who was a former partner at the Gold Firm. These complaints span 10 years and allege excessive fees charged by the Gold Law firm, which then abandoned its clients either because the firm was mismanaged or because the partners simply didn't care as long as Middleton brought home the bacon from clients. Either way, the Gold Law Firm benefited at the expense of its own clients, mostly women, who sought fair representation at a particularly vulnerable time in their lives. The Gold Law Firm has since sued several former clients to collect on large bills that were well outside the norm for divorce cases. So when is the law firm responsible, and where is the board's head Chuck Plattsmier when you need him? A judge has thrown out a lawsuit alleging excessive fees levied by lawyer Ogden Middleton in which Dr. Tommie Mack Granger was trying to gain class-action status. Another lawsuit on the same topic but involving The Town Talk is now on appeal to the 3rd Circuit Court of Appeal. Ninth Judicial District Judge Rae Swent threw out Granger's lawsuit on the grounds he filed it too late. Granger's attorney, Staci Villemarette of Lafayette, had withdrawn from that action on the grounds she doesn't get involved in class-action lawsuits. 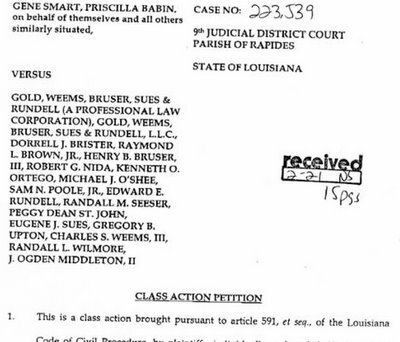 Swent ruled that it was too late to file the lawsuit for legal malpractice. A separate lawsuit covers the claims against Middleton for alleged excessive billing, Swent said. That lawsuit, Gold v. Granger, is now before the 3rd Circuit. Judge Harry Randow ruled that Granger owes $49,999 to the Gold, Weems, Bruser, Sues & Rundell law firm along with $7,500 in legal fees and $5,000 in expenses. Originally, Granger owed about $112,000, and the law firm sued him. The state Supreme Court ruled that a jury had to hear the case if the demanded fees were more than $50,000. So, the firm lowered its demand. When the matter went to court in May, the amount claimed was $80,493.01 because legal fees and interest were added. Randow found in August that the Gold firm's fees -- most of Granger's business was handled under the direction of Middleton who has since left the firm -- were not out of line as claimed by Granger. Granger has served notice that he will appeal. The matter also involved court secrecy. At one point, Randow, after closing the courtroom over the objections of a Town Talk reporter, was reversed when he ordered the media not to report any complaints filed against the law firm, Middleton or both. To this date, the state Attorney Disciplinary Board has not acted on the alleged complaints. A Web site, www.ogdenmiddletonvictims.net, indicated on Monday that it had been 1,228 days since the first complaint was filed. David Hesser, who was the law firm's attorney but has since left the firm, said he was told not to discuss the case. Chad Dudley, one of Granger's attorneys in the class-action lawsuit, could not be reached for comment Monday. He is in Baton Rouge. 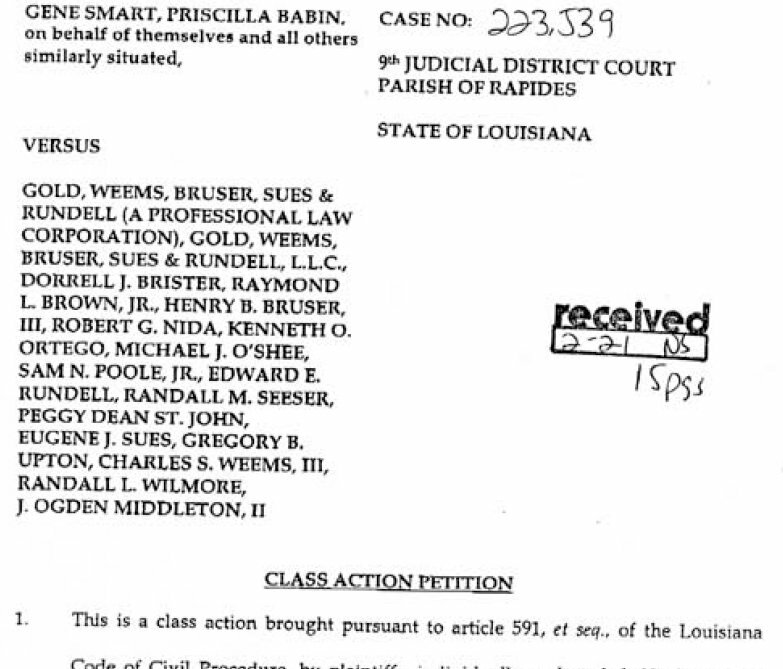 Priscilla Babin, who was added to the class-action lawsuit, said she did not know of Swent's decision, so she could not comment.